The HUMAN RIGHTS campaign annually publishes an index of companies applying the principle of gender equality and gives a bad mark to those who are not inclusive or downright homophobic. 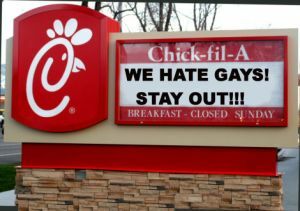 The last to come into contention, the fast food restaurant chain "Chick-Fil A", looks down on all that is gay and believes that marriage is exclusively the traditional man-woman couple. This rejection is so ingrained that they make donations to Christian organizations that encourage the murder of homosexuals in Africa. You've heard of the Anti-Gay law in Uganda, often called "Kill the Gays Bill»? Financial support comes from these Christian organizations, themselves supported by "Chick-Fil A" (what about their Christian charity?). Aramis-International recognizes the equality between men and women, regardless of their sexual orientation. We are the only organization stating that sexual orientation is innate (science tends to demonstrate it), that we were created by a human civilization from another planet and that we resemble them. Even if we do not agree with the principle of a marriage contract between two individuals, as done for cattle or objects, we will support and will defend the right and freedom of everyone to access marriage, as long as this is their free choice. For ARAMIS-International, the Universal Declaration of Human Rights and all bills of rights arising must take precedence over any other social, ideological or religious consideration. To identify the 8 homophobic companies you probably support without knowing, by reading this, now you will know!